« Jack Ham Says Rally High-Five! 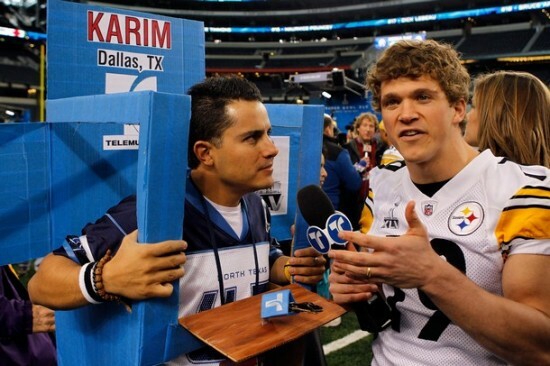 The Tuesday before the Super Bowl is Media Day, and that means … SHENANIGANS! TOMFOOLERY! PEOPLE IN SUPER HERO COSTUMES! HIJINKS! And a super long What They’re Really Thinking: Media Day Edition. Enjoy it, Burghers, because this may be the last one of the season if those kids don’t get their ten thousand dollars. WHERE’S YOUR GOD, NOW?! But no, really. No WTRT: Super Bowl Edition unless we hit $10,000 on Monday. I bet if you count your change up, you have three dollars you can give us? Yes? Please? Let’s talk tomfoolery. Shenanigans! Hijinks! People in — ah, you get the picture. 1. 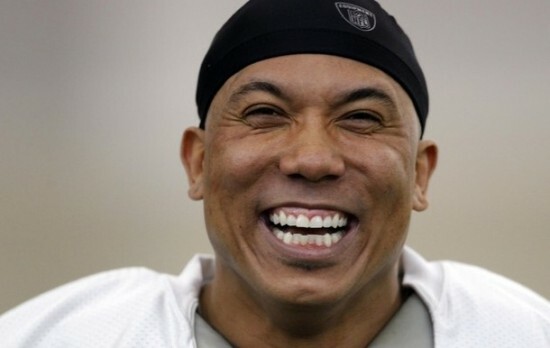 Going back to Monday, which was travel day, the Steelers arrived in style, particularly Hines Ward, who takes Texas srsly. 2. 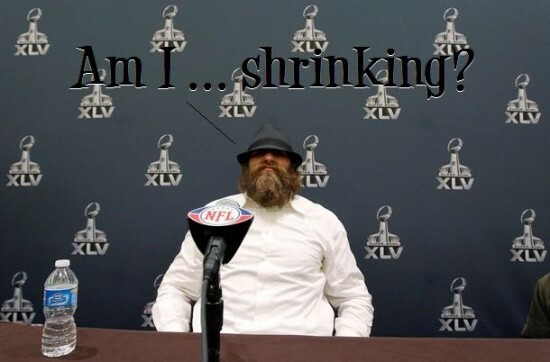 Also on arrival day, it became evidently clear that Brett Keisel’s transformation into a garden gnome is almost complete. Luckily, Brett resurfaced in his normal size after drinking Embiggen. The new energy drink. 3. We interrupt this What They’re Really Thinking to say: If Viagra ever makes an energy drink, they should call it Embiggen. Thank you, Hines. You don’t have to try so hard. 4. The next day dawned and the players prepped to face the media for relentless questioning. That man in the background is either the badassest badass that ever badassed, or he’s escaped from the hospital. Who can know? The most amazing thing? That’s a JUMP ROPE he’s pulling out of there! AND IT’S WRAPPED AROUND A BUICK. 6. We interrupt this What They’re Really Thinking to say SQUEEE! TYLER GRISHAM! Me gusta mucho very muchisimo! 7. 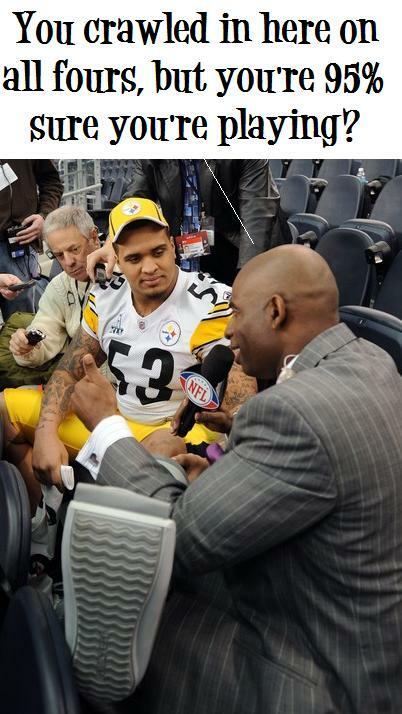 Maurkice Pouncey spent the day trying to convince reporters he has a “75% chance” of playing on Sunday. 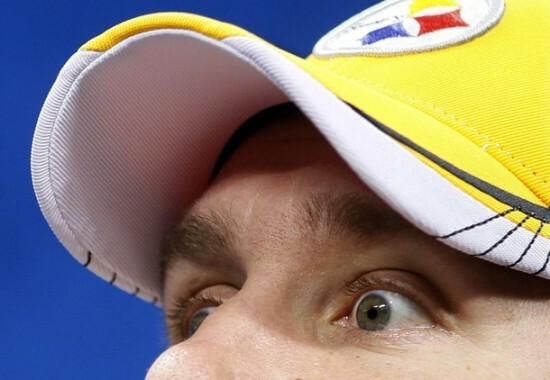 You guys, if he ends up playing, I will eat my hat. I will EAT IT and I will tape myself eating it and I will post it on YouTube. Me. Eating my hat. Nom. 8. 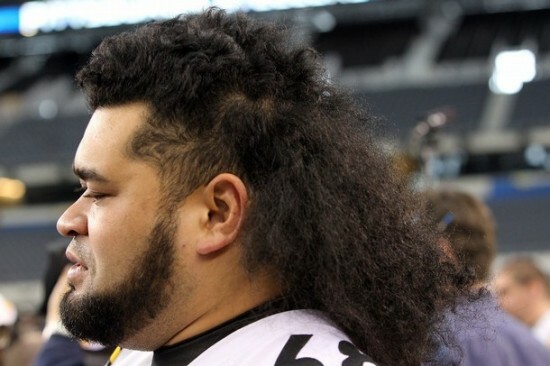 Penalty-prone Chris Kemoeatu was kind enough to be a walking public service announcement warning of the dangers of what could happen if you too were to let a rabid gopher cut your hair. With its teeth. 9. It can be a bit daunting on Media Day if you’re a female sports reporter caught up in a tsunami of testosterone and Axe spray. You have to maintain your cool. Be professional. Show you know your football just as well as the men do. Earn their respect. Like Mexican television reporter Ines Sainz, the woman the Jets got in trouble for cat-calling and whatnot in their locker room. She doesn’t want attention. Not at all. Unfortunately, her attempt at blending in failed miserably. Benny almost had an aneurysm, I heard. Poor poor Ines Sainz. I do not know how she bears that cross. 10. 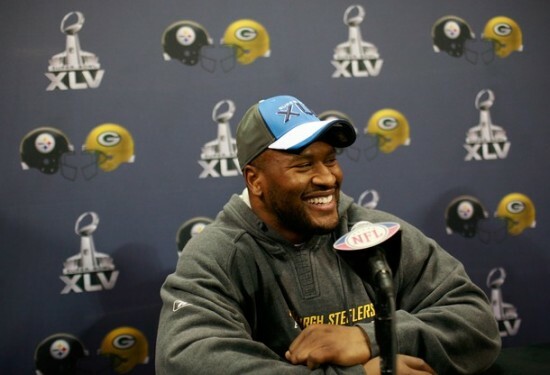 Jason Worilds spent the day doing anything to get reporters to pay attention to him. I smell desperation. And Axe. I’m kidding! Don’t email me mean letters. 11. We interrupt this What They’re Really Thinking to say: If Axe makes an energy drink, they should call it Desesperado. 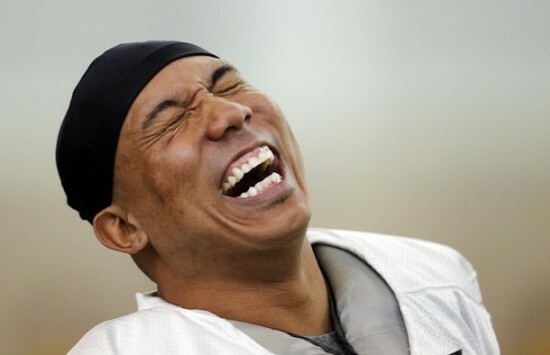 Okay, Hines. That’s quite enough. 12. Finally, I would just like to say in my defense about the fact that I didn’t know who the hell Random Dude Named Brown was up until last week, some of his teammates still aren’t sure who he is. You want more on Monday? Clicky the Donate linky button up there! Donate, check! Can’t wait for Super Bowl WTRT!!! That was worth the $20. Buick! 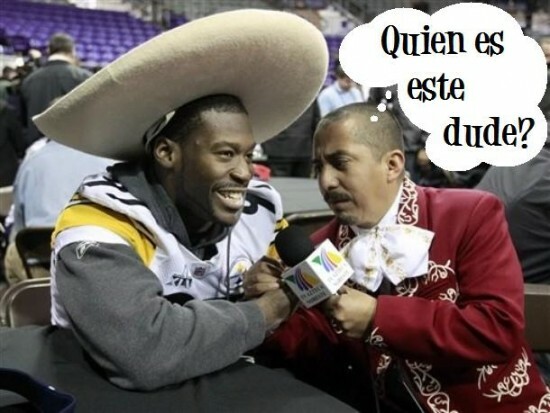 LMAO! And is it me or is Ben beginning to look like Morgan Grimes? LOOKIT! FORTY-FOUR! WE HAVE A FRIGGIN’ TANK SIGHTING! And is it just me, or does Larry Foote look like someone out of a Kung Fu movie? Who is seated between Tomlin and Ward in the team picture? Do we have a mascot? 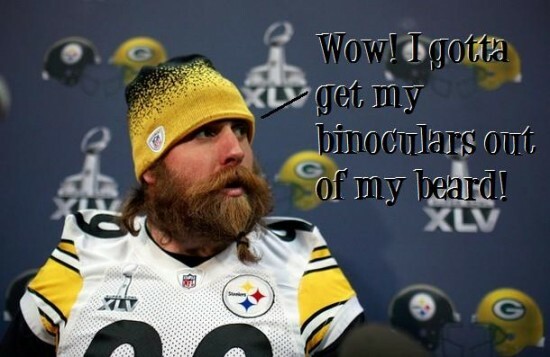 The Keisel gnome photo is CLASSIC!!!! 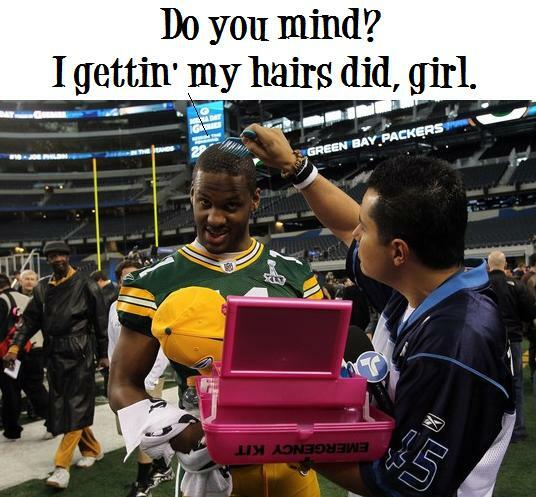 Are you in Dallas or are you just gettin’ good photos sent back? Love the post and HIMYM references, as always. Thanks for the great laugh! I gave my Lincolns to the cause. I challenge those reading (and laughing) to do the same. 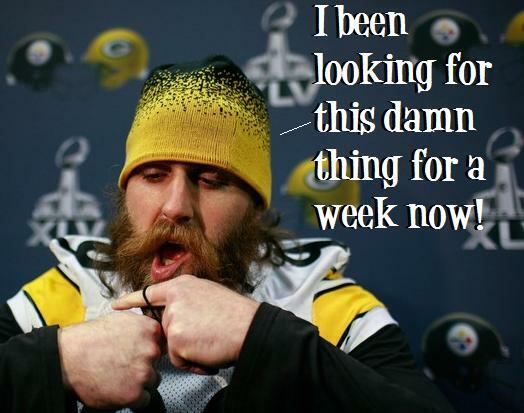 The Keisel/Gnome pic made me laugh out loud at work, which made me clamp my hands over my mouth. Which made brainial material shoot out my ears. And I’m in for MRFK. So if, by some travesty of nature, the 10K mark is NOT hit, you still have to write WTWRT and send it only to the cool kids who donated. LaReina, I was wondering the same thing. Anyone? 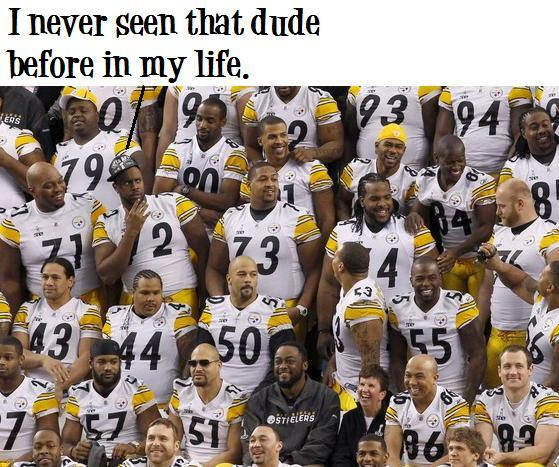 Also, Hiiiii Heath Miller in the group photo, you cutie patootie you! Ok, my donation is in! This was awesome – thanks! 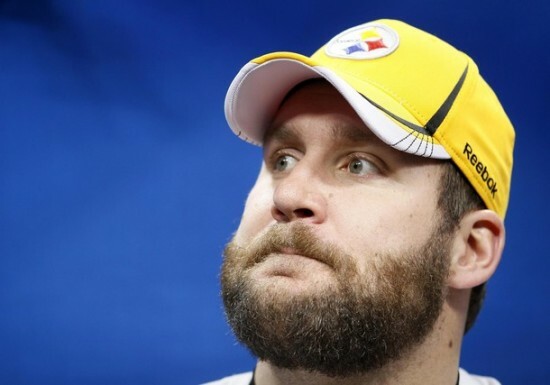 The woman between Tomlin and Ward works for the Steelers. She does a lot of the writing for steelers.com, including the Playoff Diary segment. BTW, if you have never read it, you really need to read the Playoff Diary. She gives great behind the scenes insight to what goes on for the team each day of the playoffs and Super Bowl week. The pictures are especially good, because they are ones that the regular media would either never have the opportunity to take or would never think to take. Thanks, H. She was just an unfamiliar face – and quite clearly a lot smaller than the behemoths surrounding her in the team photo! Inez looks like one of the 10,000 strippers Dallas is supposed to be lacking for Super Bowl week. Is that a runway she’s walking? 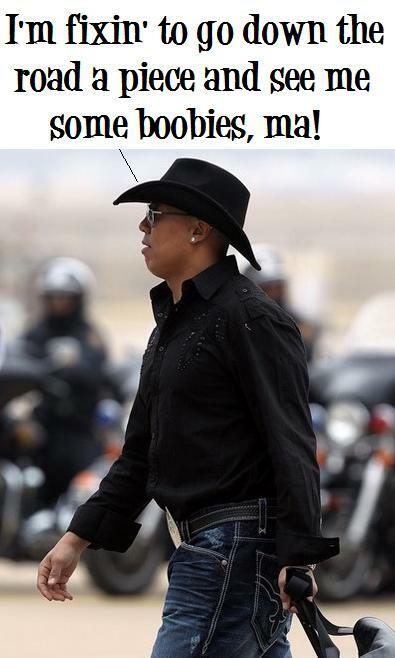 Where’s the pole? Ginny — you’ve outdone your bad self. Thank you! 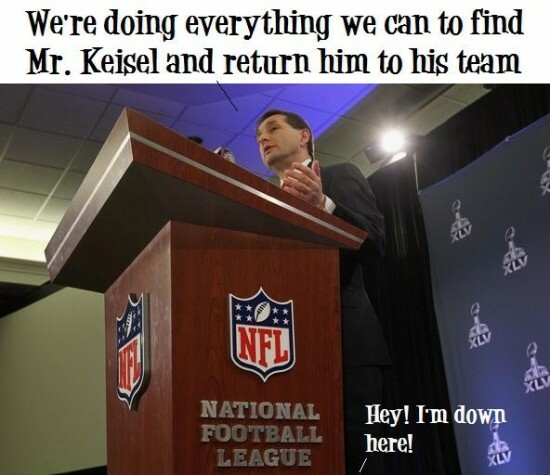 You had me at Keisel Gnome… genius. Donation done. Easy – Peasy for the kids — bring on the Super Bowl WTRT!! Donation done, please post WTRT on Monday …pleeeeeeeeeeseeeee!!!! They make my week! Thanks for making me laugh today!! 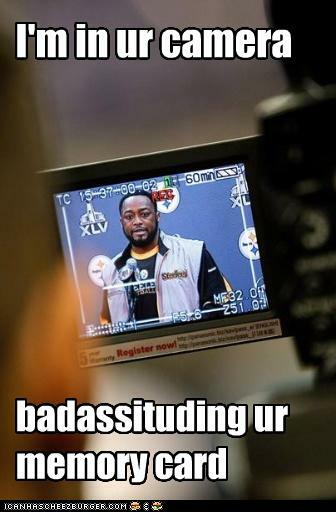 Jason Worilds is one awesome Hokie. I’m so stoked for Sunday!